Located at 2/7 Okunla Martins Close, Off Okotie Eboh Street, Off Awolowo Road, Ikoyi, Lagos, Nigeria, Villa Angelina Hotel is a 3-Star hotel situated in a serene and tranquil environment. 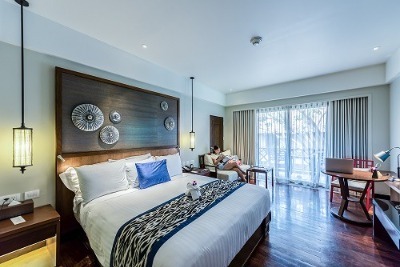 The boutique-styled hotel offers its guests affordable luxury, efficient service and modern amenities. Villa Angelina Hotel has a total of 40 elegantly furnished rooms which are of various categories. These categories are: Standard Room (Annex and Main), Junior Suite, Deluxe (Annex and Main), 2 Bedroom Apartment and Deluxe Suite. These rooms are spacious and are equipped with modern amenities, such as: air-conditioning units, king-size bed, cable TV, safety deposit box, sofas, work desk, a fridge and en-suite bathroom. Guests are entitled to complimentary breakfast. Certain facilities have been put in place by Villa Angelia Hotel to ensure that the stay is memorable and stress free. These facilities include: conference facility, free Wi-Fi, swimming pool, a modern gym, 24-hour power supply, an adequate parking space, a restaurant where guests can order from a wide range Indian, African, Oriental and International meals prepared by professional chefs and a bar that is well-stocked with alcoholic and non-alcoholic drinks. At Villa Angelina Hotel, security personnel guard the premises round-the-clock. Villa Angelina Hotel offers additional services to it guests upon request. These services are: laundry/dry cleaning services, airport shuttle services, bike rental services, 24-hour front desk/housekeeping services and concierge services. Payment: Cash, Visa and MasterCard accepted here. Q: Does Villa Angelina Hotel offer free Wi-Fi? A: Villa Angelina Hotel offers free Wi-Fi to all checked-in guests. Q: Does Villa Angelina Hotel have a swimming pool? A: There is an outdoor swimming pool in this hotel. Q: Does Villa Angelina Hotel offer complimentary breakfast? A: Yes. Guests are entitled to complimentary breakfast. Q: Is there a fitness centre/gym at Villa Angelina Hotel? What type of equipment are available? Q: Does Villa Angelina Hotel have a restaurant? A: A restaurant is available at Villa Angelina Hotel. Villa Angelia Hotel is a top-class hotel in Ikoyi, Lagos. The place was really good. I would recommend this hotel to anyone on any day, as I have been there before and would still love to go back there again. Their service delivery is amazing, they have courteous staff, good facilities and the place looks well-managed. I had a wonderful time. I honestly enjoyed my stay at the hotel, I had a warm welcome and the receptionist was very awesome. Although I wasn't too comfortable with the service at the restaurant. They shouldn't get too complacent. However I enjoyed the service and facilities provided at the hotel. i enjoyed my stay when I visited the hotel. nice ambiance and services. I would describe my stay at the hotel as home away from home.The hotel is very lovely and peaceful,the staff is well dressed and very polite. I had a splendid stay at the hotel. Very sceren environment clean and secure. Plus the buffet was fantastic. Have nice pictures of Villa Angelia Hotel?